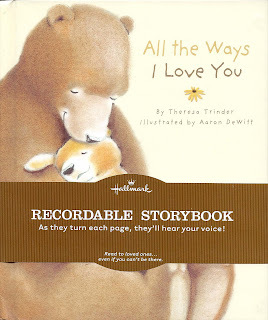 It's a Hallmark Recordable Story Book that Kimbralee made of her reading the story to Bryson. We waited until bedtime to have him read it and as Mike and I sat in bed with Bryson and listened to Kim read him the story, our hearts melted. Hearing Mommy Kim read Bryson such a cute story about how much she loves him was one of the most tender moments we've ever experienced together as a family. It was one of those moments only those with adopted children can fully understand. Bryson just beamed from ear to ear throughout the entire story. When the story ended and Bryson heard Kim say "I love you Bryson" he replied right back without hesitation, "I love you mommy Kim!" After that, Mike and I just looked at each other with tears streaming down our faces. Gosh, what an amazing gift!!! We love her so much!!! It's such a sentimental gift and I know he'll treasure it FOREVER!!! Bryson is such a loved little boy. Here is a short video clip (1:46) of Bryson reading the story again this morning. I've heard him in his room listening to it about 20 times since. He can't get enough of it! After each time he hears it, I always hear his little voice say, "I love you Mommy Kim. Bye!" So cute!! !